When you think about it, the architecture of most K-12 schools today is designed for an instructional model that’s long outdated. Schools typically are organized into long, often windowless corridors, lined with 900-square-foot classrooms—a floor plan that consigns teachers and students to working in relative isolation behind closed doors. It’s an assembly line design that crowds teachers and students into a single room that’s less than ideal for engaging in multiple activities at the same time. Space is limited and noisy if students are working collaboratively. Other useful space—such as libraries, science labs, or other instructional areas—are down the hall and out of sight of the teacher. None of this was a problem in the 1950s, when teachers were more likely to stand at the front of the classroom and lecture—and students were expected to listen or work quietly at their desks. But this industrial-era floor plan is far from ideal for the kind of instruction that’s needed in the 21st century. Today, technology plays an increasingly active role in daily classroom work, and educators see the ideal instructional model to prepare students to be college- and career- ready as incorporating a mix of small-group collaboration, personalized instruction, projected-oriented learning, and student-led learning. To make this possible, however, teachers need more room—and, more importantly, more flexibility in their instructional space to permit different learning activities to take place at the same time. What’s needed is a school building like Dearborn STEM Academy’s new modernistic, cutting-edge campus, now under construction in Boston. A glance at the architectural drawings for this new building, which the grades six through 12 academy will move into next year, reveals a working environment that wouldn’t be out of place on the high-tech “campus” headquarters of such cutting-edge, high-tech corporations as Apple, Google, or Microsoft. The core of this brick-and-glass structure is a huge “learning commons atrium” that soars four stories high. On each floor, a balcony encircles this large open area and serves as a hallway to the classrooms and other instructional space that line the building’s outer walls. For all of the aesthetics of this $70 million project, the truly important design element of the 128,000-square-foot building is the flexibility of its learning areas, specifically designed to meet the instructional needs of teachers and students in the 21st century, says Jonathan Levi, whose architectural firm designed the school. Instructional space is organized into cohorts that group classrooms, science labs, makerspaces, and smaller, more flexible learning areas into small, separate learning communities. The goal is to provide teachers and students with a variety of learning areas for collaboration, project-based learning, and independent work, Levi says. For example, some students can work on a class project in a main classroom, while the teacher takes a handful of students into a smaller, adjacent room for more personalized instruction. Meanwhile, another group of students might collaborate on a report at a nearby “learning commons”—an open area of tables, chairs, and whiteboards that will be located on the balcony/hallway outside the classroom. This classroom arrangement provides teachers with the space and flexibility to have students engage in multiple activities without being crowded into the limited and artificial confines of a single classroom. Yet, the teacher can keep an eye on everyone: Floor-to-ceiling glass walls provide a line of sight to each of these instructional areas. Similar thinking went into the design of Hamilton Southeastern College and Career Academy in Fishers, Indiana. This new addition to a local high school organizes classrooms into “learning hubs” with glass walls that open, large collaborative spaces, and a 5,500-square-foot science lab that allow students from multiple classes to meet together. The flexibility of this design aligns closely with the school district’s efforts to move from teacher-directed to student-led instruction, says Principal Matthew Kegley. This push for flexibility may mean “there is no front to the classroom” anymore, suggests “Blended Learning Design Guidelines,” a white paper produced by Perkins Eastman, an international design and architectural firm. This thinking can be seen at Dearborn—and in dozens of other award-winning school designs that feature numerous styles of learning areas. It’s also inspired an aesthetic that mirrors the modernistic and exciting new look of cutting-edge college and corporate offices. The goals of making students “college- and career- ready,” along with a growing interest in STEM (science, technology, engineering, and math) education also are encouraging the development of learning environments that emphasize collaboration, personal responsibility, and project management. As architects design these flexible and engaging learning environments for students and teachers, they’re not overlooking an important asset that surrounds every school: the outdoors. Although outdoor classrooms have been a fixture of education since Socrates, there has been growing interest in incorporating courtyards, green spaces, gardens, nature walks, and “outdoor learning labs” to recent school construction and renovation projects. One such school is Solana Ranch Elementary School in San Diego, California. Taking advantage of the region’s warmer climate, architects designed many classrooms with sliding glass or garage-style doors that open up an outer wall and expand classroom instructional space to outdoor tables and benches. Meanwhile, Richard J. Lee Elementary School in Irving, Texas, features an outdoor courtyard in the middle of the building, with stepped seating allowing a class to meet in the fresh air and natural light. Adjacent to the school are a paved courtyard, pond, and garden that teachers and students can use, as well. School leaders and architects also are taking a lesson from research showing that bringing natural light inside schools has a measurable impact on student learning and engagement. At Dearborn STEM Academy, for example, many classrooms will feature wall-to-ceiling windows, while skylights over the central atrium will bathe the school’s interior with natural light. In Florida, the Orange County Public Schools have worked to incorporate many of these design elements into the schools constructed or renovated in recent years, says Faz Ali, the district’s senior facilities director for planning and design. Not all of these elements are cutting edge—an outdoor classroom may be a simple grouping of benches under a tree—but it has its benefits. Not surprisingly, technology is a growing influence in the design of modern schools. Where computers were once consigned to a specialized classroom, laptops and hand-held devices today are a ubiquitous presence—and technology’s increasing importance in everyday learning must be incorporated into the physical infrastructure of every campus. Laptop computers and personal devices also are being accommodated in different ways. There is a greater need for tables with “plug and play” power and data ports, and, as at Hamilton Academy, there’s a growing prevalence of smart boards and video screens that are accessible to student devices by physical port or Wi-Fi. As more schools focus on STEM education, other design elements making their appearance are makerspaces, robotics rooms, and fabrication laboratories dedicated to project-based learning not easily conducted in a regular classroom. Yet, as much as possible, educators and architects are trying to incorporate the needs of project-based learning as close to the classroom as possible, O’Donnell says. Thought is going into some of the subtle changes in learning created by personal devices. As elementary schools build common learning areas adjacent to classrooms, architects are incorporating small nooks—some with beanbag chairs—where younger students can sit and work independently on their devices. At high schools, coffee shops and lounge areas allow older students to use their time as they see fit, whether it’s working on a class assignment or taking a break and watching Netflix. The challenge with all this technology, however, is that it keeps changing, which poses a dilemma for school leaders and architects. Older schools built for an era of pencils and blackboards must be upgraded to handle whiteboards, hand-held devices, and increasingly high-tech equipment. Yet, what about newer schools? Can they be designed so they will not be obsolete before their time? These questions have school officials and architects pondering how to design modern schools so they can more easily adapt to the unpredictable needs of instruction in future decades. One response to this concern may be found in the new science and technology building being built on the campus of California’s Santa Monica High School. The $55 million construction project features a modern design with fewer load-bearing walls and a raised floor, a design that allows walls to be reconfigured more easily in the future, while new wiring and data ports can be moved by lifting floor panels. at Harley Ellis Devereaux Architects. That’s not to suggest that existing buildings cannot be adapted to the needs of 21st century learning, O’Donnell adds. Nearly 70 percent of the school design work done by Perkins Eastman involves older buildings, he says. Recently, the firm designed the renovation of Watkins Elementary School in Washington, D.C., providing the aging school with more open, light-filled classrooms; larger, more flexible rooms; and a state-of-the-art media center. For the immediate future, several factors are converging that require school leaders to educate themselves on the design elements needed in new schools—and it’s not too early to start learning, Levi says. 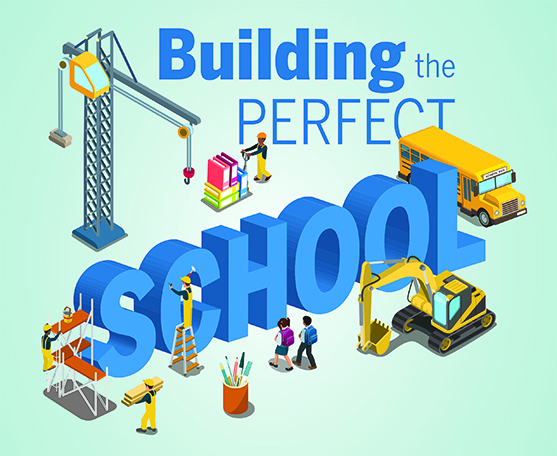 The good news is that school leaders can easily access the resources they need to make sound policy decisions on construction and renovation projects, architects say. For starters, a school district’s facilities personnel are a valuable resource. So, hopefully, your school board is strengthening your staff members’ knowledge base by supporting attendance at conferences and other professional development opportunities that keep them on top of the latest issues and trends in school architecture. It also wouldn’t hurt your school board to do a little research itself—if only to learn enough to ask informed questions of school facility directors and architects. O’Donnell suggests that a good start is to go online and visit websites that highlight award-winning school projects. If any project looks appealing, he says, go visit them. Also take advantage of the practical knowledge of those who will work in your new buildings, he says. Survey teachers about the design elements they’d like to see in a new school, and work with an architect who is willing to engage with teachers about how they teach and what they need in instructional space to get their job done. Del Stover (dstover@nsba.org) is senior editor of American School Board Journal.